Create, name and display multiple reticules simultaneously to compare the fields of view of different camera and telescope / lens combinations. Great for evaluating prospective investments in new equipment! Arrange multiple reticules by panning them horizontally and vertically. 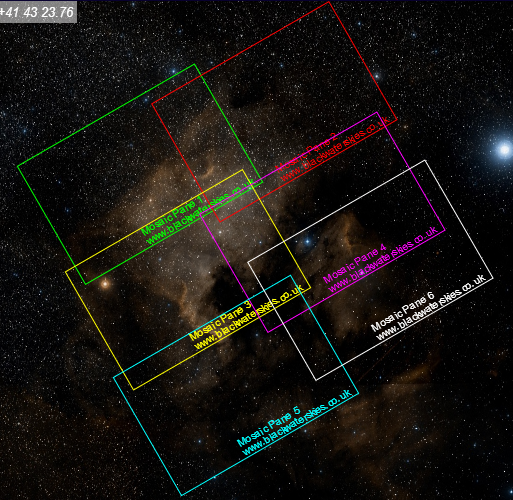 Handy for planning a wide-field mosaic consisting of several image panes. Save all existing reticules to your browser and reload them automatically on your next visit. Experimental support for tablets/smartphones with a display that re-sizes to fit narrower screens. The new version of the Imaging Toolbox enables you to create multiple reticules and display them simultaneously using the new 'Compare' tool. One use of the new 'Compare' tool is to visualise the effect of different cameras and telescope combinations on the same target. Hopefully this will take some of the guesswork out of planning to invest a significant sum of money on a new camera or telescope. 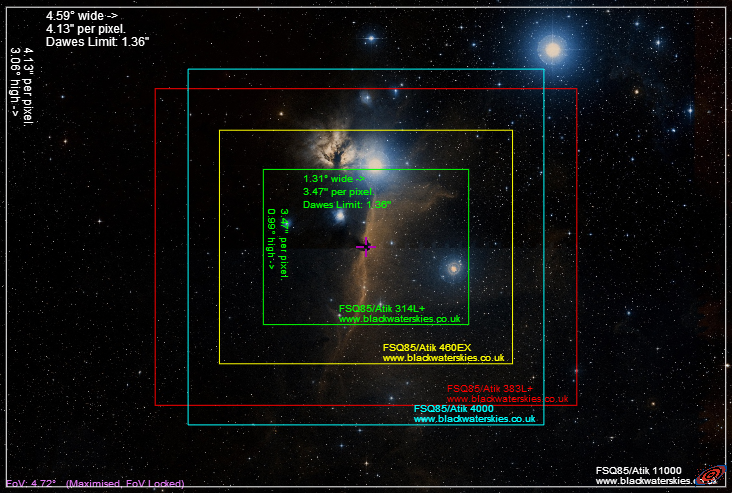 As well as rotating the reticule, you can now pan it vertically and horizontally relative to the centre of the main sky image using the 'Pan X' and 'Pan Y' tools. Full release notes for the latest version of the Imaging Toolbox can be found below, and more information is available in the Instructions. Removed 'Simple Forms' option as hopefully no longer required due to new forms layout. Zooming limits only work if the current reticule is displayed, i.e. if other reticules are displayed but the current one is not, it is possible to zoom wider than 90 degrees, which will may lead to erroneous display of the field of view in the other reticules at such large scales.